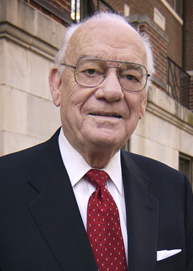 Dr. John L. Blackburn began his long association with higher education after serving in Indo-China during World War II. First, he served as an instructor in the United States Air Force; then at Florida State University in 1951 and 1952, where he experienced the first of a series of events which placed him on the cutting edge of innovative change in higher education in the United States. As an administrator at Florida State University, one of his tasks was to assist in integrating male students into the previous Florida State College for Women. He began his career at The University of Alabama in 1956 and he became Dean of Men in 1958. In 1963, his dedication to progress and meticulous planning were credited as key elements in the historic peaceful integration of African-Americans into the Capstone. In 1968, the men’s and women’s student affairs functions were consolidated and Dr. Blackburn was named Dean of Students and the Office of Student Affairs assumed a much larger and more important role in the life of the University. In 1969, Dean Blackburn became Vice Chancellor for Student Affairs at the University of Denver. Blackburn was able to develop his theories on the restructuring of college campuses as well as implement many of them. In 1972, under his direction, National Association of Student Personnel Administration conducted a conference on The Communitization Process in Academe, with Dr. Blackburn writing the introduction to 21 innovative communitization approaches. Dr. Blackburn turned his attention to the burgeoning opportunities in university resources. In 1978, Dr. Blackburn returned to UA and over the next 12 years helped to raise more than $30 million dollars, once again finding himself in the forefront of a changing emphasis for public education into the world of private development. He served as President of the National Association of Student Personnel Administrators from 1973-1974 and as President of the American Association of University Administrators from 1977-1979 and 1985-1986. As an educational consultant and as past general secretary of the American Association of University Administrators, Dr. Blackburn found himself more interested in effective innovation in higher education. Blackburn retired from UA after more than 30 years of dedicated service, and remained vitally interested in the continued healthy development of the Capstone. Dr. Blackburn was active in the civic affairs of the city and state and served as the Interim Chairman of Challenge 21. Dr. Blackburn passed away in July of 2009. He is dearly missed by those who knew him and had their lives touched by his good works. However, his legacy of service and commitment to civic duty lives on through a network of young professionals and future leaders.